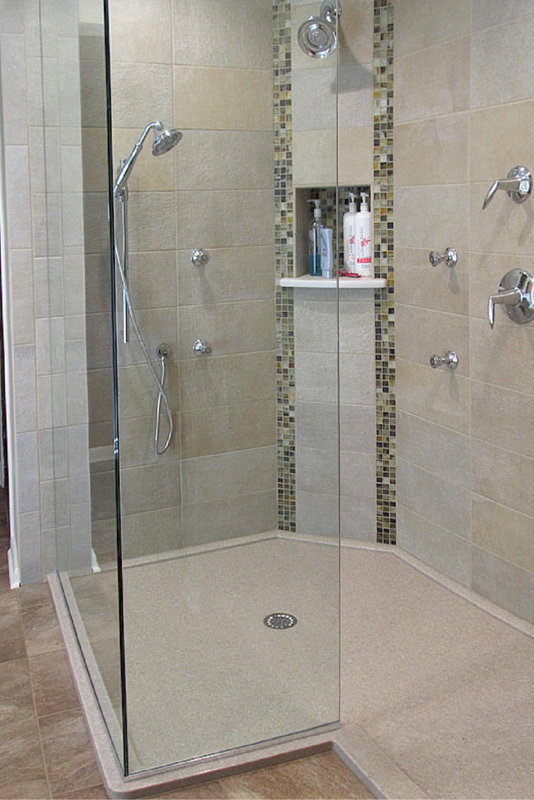 Low maintenance – since this base is one solid unit there are no grout joints to hassle with. That’s a HUGE victory for you over your scrub brush! 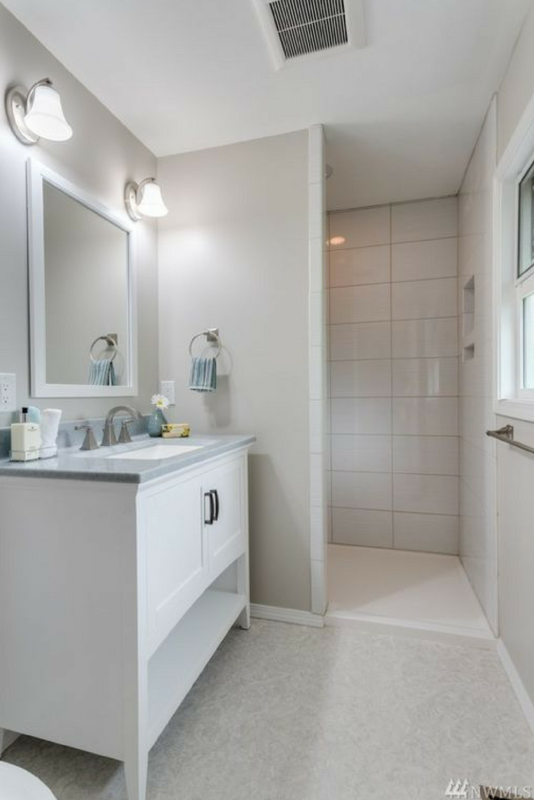 Custom solid surface bases can accommodate any design – If you’re looking for a custom design, cultured stone shower pans and expanded ready for tile bases are by far the most flexible. 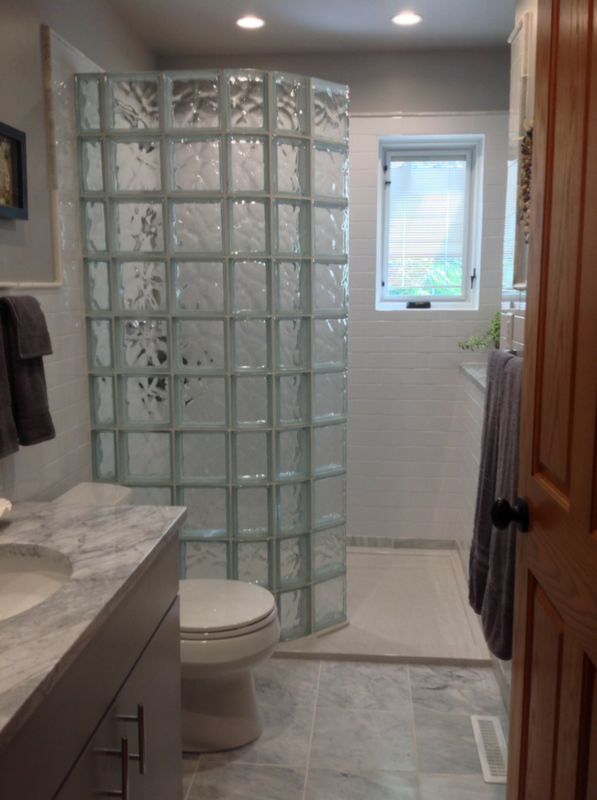 Solid surface pans can accommodate angled, curved or odd shaped glass or glass block shower enclosures. Waterproof – solid surface bases are very durable and have no seams making them a waterproof solution. That will give a the piece of mind knowing you won’t get an expensive leak in your floor below. 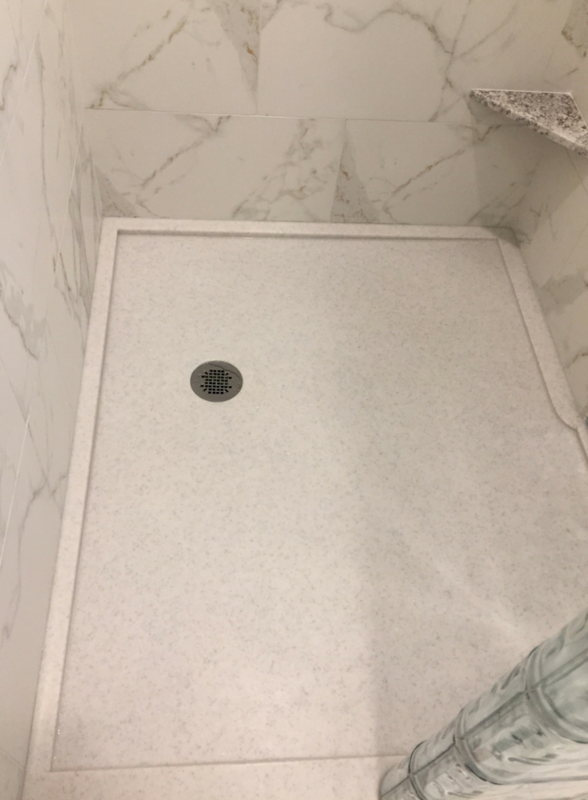 Different curb options– Since people have different levels of mobility the design of the curb of the shower pan is very important – and more options can create a safer showering environment. 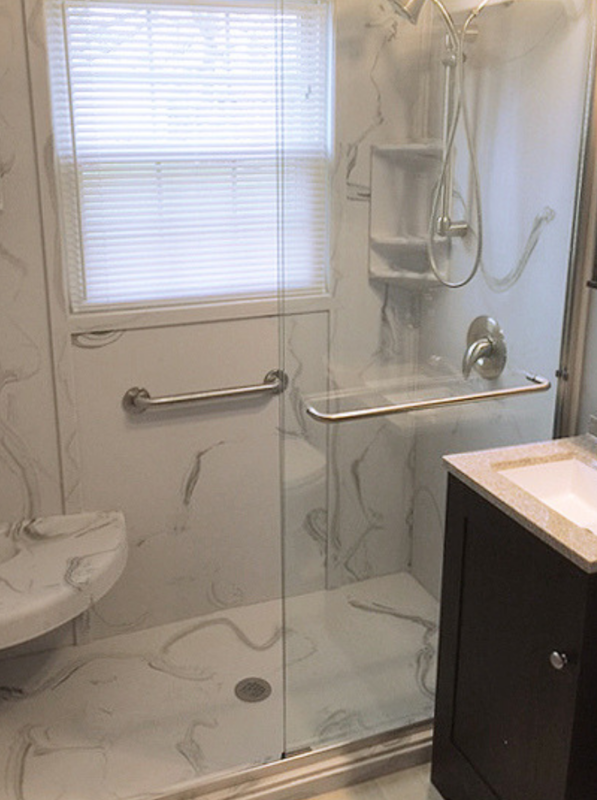 With a solid surface pan the options include full height (about 4 1/2″ tall), mid-height curb (2 3/4″ high) and a low profile pan (1 1/2″ to 2″ high) and built in ramp entries (to create an accessible shower design). These curb designs can make an aging in place bathroom design work wonderfully. No finishing material is needed over the top of the base – Unlike ready for tile bases, the solid surface unit is already finished – so there is no additional cost to add tile or another finishing surface. Since the top is made with a textured matte top surface, you don’t need to worry about Mom or Dad (or a loved one) falling while in the shower. Drain location can be customized – In a bath remodeling project not having to move the drain can be a significant plumbing cost savings. With the custom solid surface bases you can specify a drain location. 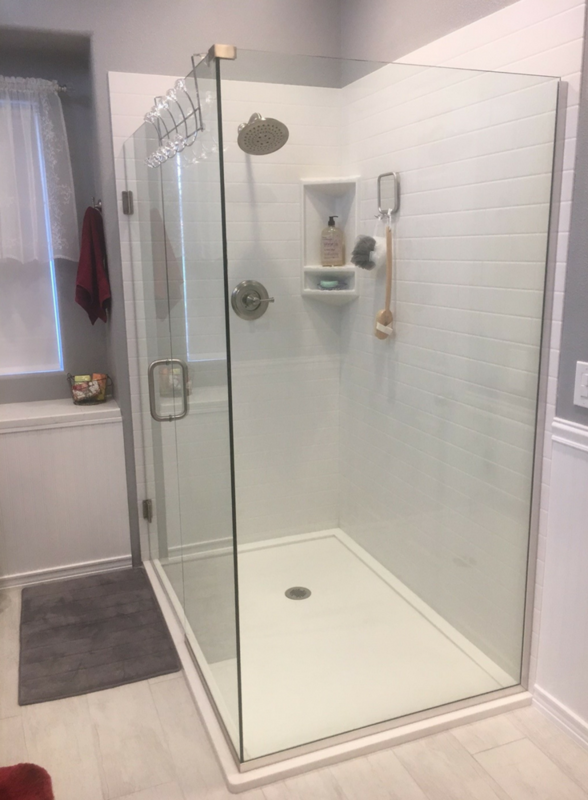 Your custom shower pan will be pre-sloped to this location (you don’t have to worry about a tile guy manually sloping your shower and dealing with pooling water anymore! Fits well with high end luxury spa bathrooms – this product is a good compliment for higher end bathrooms. The subtle look of stone products won’t take the drama of your laminated shower walls surround panels or high-end tile job. Just like us in life, solid surface (or cultured stone) shower pans have their weaknesses. Here are the top ones to keep in mind. More expensive initial purchase cost than acrylic or fiberglass bases – since acrylic and fiberglass bases are made in standard sizes in large quantities (with cheaper materials) their initial purchase costs is lower. If your job is on a tight budget acrylic shower pans can be best. These bad-boys are heavy!– Cultured stone shower pans are heavy. A 60″ x 36″ base will weigh around 120 pounds. So if you’re bathroom is on the second floor you’d better eat your Wheaties and get help installing it. This huge cultured granite shower pan weighed over 500 pounds and was pullied up to the second floor! Colors – with over 60 different colors there is something to match every decor. You can even get fancier cultured marble bases with patterns if you want to make a splash. Grout free solid surface interior shower wall panels to compliment or contrast the base – Many people love the idea of making a low maintenance high style shower – so combining solid surface walls with the solid surface base is very popular. These walls come in over 60 different colors and 4 wall panel finishes – including gloss, matte, slate and a simulated tile and stone looks. Different shapes – Whether you need a straight, curved or angled shower a cultured granite (or solid surface) base can be created. No barrier bases – if stepping over a shower curb is a problem choose a barrier free roll in shower base to make the space safer for everyone to use. 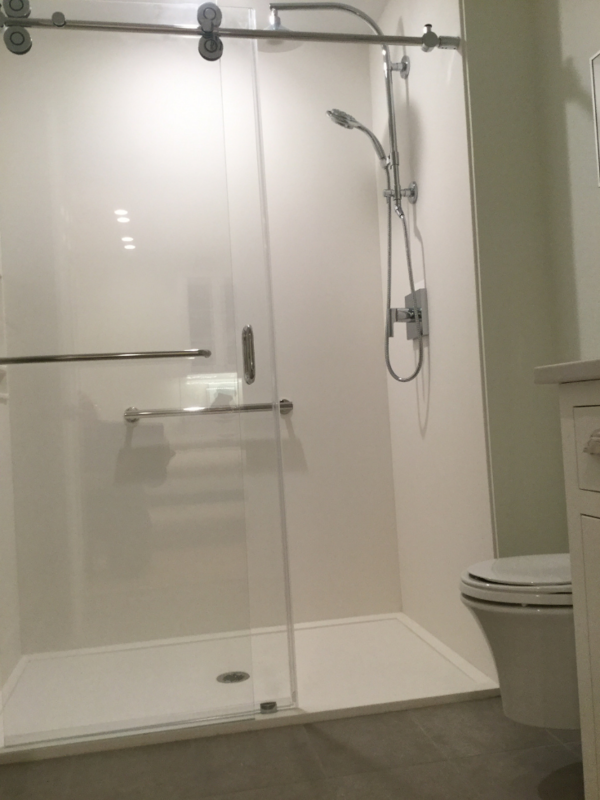 If you’re looking for more information or an estimate on remodeling a bathroom or nationwide supply of our unique solid surface bases contact The Bath Doctor in Cleveland (216-531-6085), Columbus (614-252-7294), nationwide (877-668-5888) or Cleveland Design & Remodeling (216-658-1270). 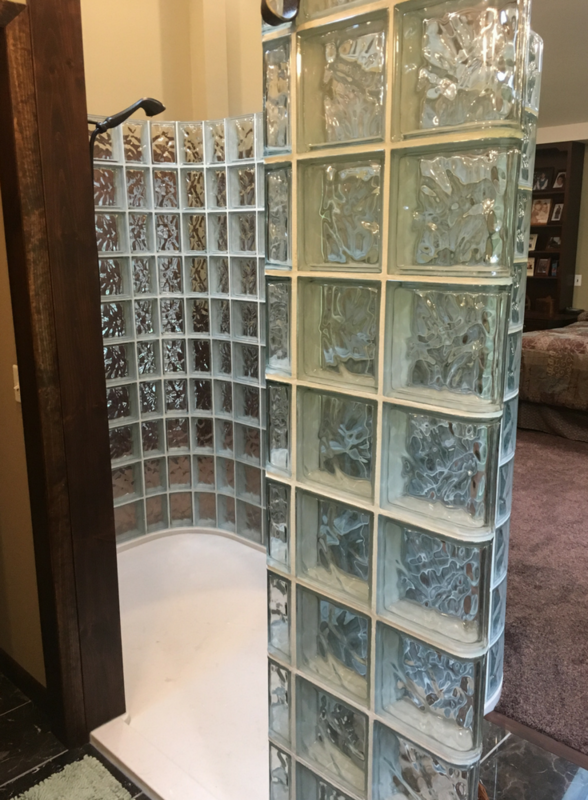 These bases can also be designed for use with glass block shower walls. This article was authored by Mike Foti. I am interested in a 42″ x 42″ corner solid surface base with solid surface walls and acrylic door enclosure. Can you recommend a kit for me?